I always had a fixation with things that can slowly burn and scent a room at the same time. I'm guessing that there are just as many others wrapped up in the whole 'candle craze' as I am, and if you are like me...deciding what to actually buy in a sea of beautifully packaged wax and wicks can be a bit tricky. I literally have drawers of votives and holders for parties, and always have several larger candles in each room in the house. I have at least a couple burning at all times. I first fell in love with Aromotique and LUX candles through the gorgeous little store, JJ Jax in Cookeville, TN. While they sell both brands in stores much closer to my house, I prefer to pick them up here—usually in bulk. This season, I am burning the Summer Sorbet votives from Aromotique. Throughout the year, every bath and bedroom in my house has at least one LUX Santa Fe candle. The clean, subtle fragrance never seems to compete with anything else going on (cooking included). When I want something a bit stronger and food is not being served, I opt for the potent, lingering scents by Diptyque. Romantic and long-lasting are standard for this Parisian line. If you're having a houseful for dinner and want to light up the table unscented may be the way to go. 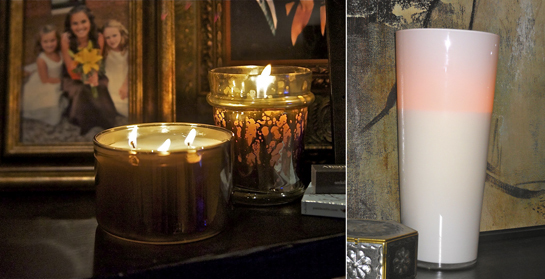 I adore the selection at The Iron Gate—where the candles line the entry to an interior designer's paradise. Of course, you'll want to pick up a few of their designer scented (and beautifully packaged) varieties, but you can also stock up on what you will need for a fragrance-free dinner party. While you're there, go ahead and splurge on at least one great scented candle for your bedroom. They have the very best. I also love the mercury glass holders from Absolution. Well-priced and a lovely addition to any space. L: Metallic and mercury glass holders are ideal for the right glow on beautifully framed photographs. One surprising locale where I discovered perhaps my favorite candle of all time is The Cotton Mill in Nashville. This is generally where I stop for the latest Nicole Miller dress or a great necklace, but their home items just keep getting better. This over-sized vessel by Maura Peters (hand poured into a blown glass vase in her studio) houses one of the longest burning and best smelling candles ever taken up residence in my living room. It's a must buy (and a really special gift... the box alone screams luxury). 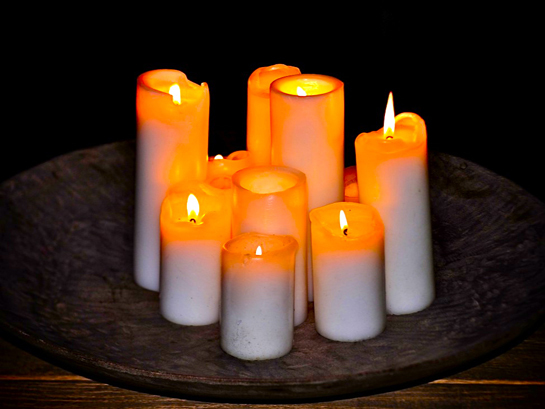 Last but not least, I like to fill my outdoor space with the glow of candle light. I count on burning torch lanterns and especially like the small surprise of burning votives hidden in tree branches and even larger bushes. I usually pick up citronella-scented votives (for added insect repellent) by the bag at World Market. For holders, I love those of all shapes in opaque green glass. They blend beautifully into any natural setting. 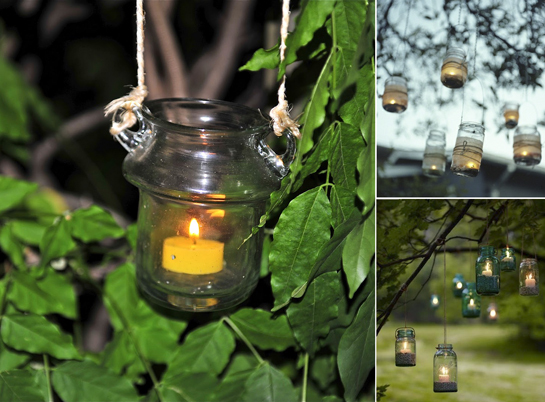 You can find them almost anywhere, and can even create your own using mason jars. Hanging jar-like 'candle lamps' found at Antiques and Garden Show.